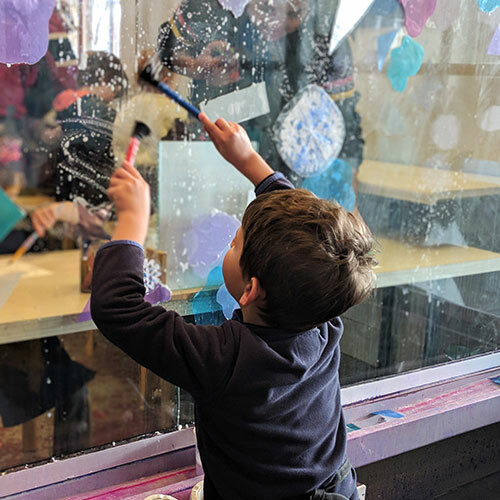 Our seven exhibitions are research-backed and provide STEM-focused, inquiry-driven experiences that help children develop creativity and creative problem solving skills. Browse our permanent and traveling exhibits below. Fab Lab is a maker space with digital fabrication technology such as 3-D printers, laser cutters, and vinyl cutters. Children have the opportunity to design and fabricate projects in this high-tech maker space. Ages 5 and up. Families will have fun exploring STEM in action – and children will get a chance to hit the (simulated) open road themselves in replica motorcycle dealership. 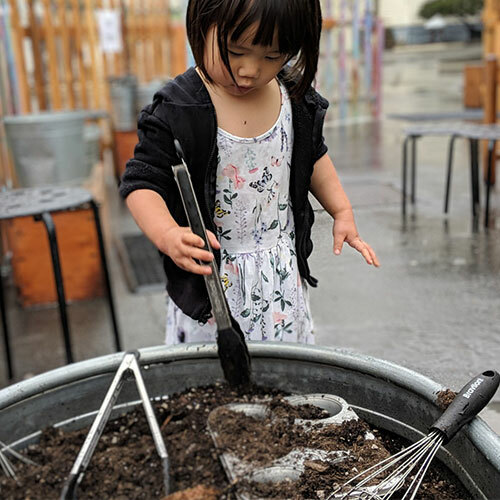 Have fun making a mess, exercising your imagination, and using real kitchen equipment to bake up mud pies, mud cakes, and more! Travel back in time and bring dinosaurs to life for your child as you explore unfamiliar landscapes, don a dinosaur costume , and more! Tot Spot is a multi-sensory experience designed for infants and toddlers only (under 42 inches in height). This exhibit offers crawlers, early walkers, and toddlers a safe and stimulating environment to explore. Toddlers only. There are endless ways for children to have fun, try something new, get messy, and explore creativity in the Art Studios. Lookout Cove is a 2.5-acre interactive outdoor exploration area featuring natural elements and iconic Bay Area landmarks for children to play on. All Ages. Children enjoy a playful simulation of the Ports of San Francisco and Oakland. Bay Hall features boats, the wharf, and an underwater tunnel, plus vintage train sets. All ages. Imagination Playground features soft and oversized foam blocks, noodles, and chutes with holes and shapes that fit together in a multitude of ways, allowing children to transform their environment. All ages.